I have to be honest, I was daunted by this material. It is big, it's expensive, it's extremely precise and it seems to only be available from neinhaus which is even more expensive than normal expensive. My only option really was to make it, but, as mentioned before, it's so precise! The whole point of it is to be exact, shapes that are congruent are 'exactly' the same. I thought about several materials, thick card was first, very thick card like mount card was next but I wanted the pieces to have real depth to them. Corrugated card was a strong contender and I may even go there if I have to remake any but I avoided it because of its tendency to squash on the corners. In the end I went for foam board, it is good because it cuts cleanly, but not ideal because the edges can crumble if you're not careful. It's saving grace was the price tag, £4.99 per board and I used 2, so £9.98 total compared to over £260 just for the square figures from neinhause. Of course they are amazing quality, made from iron, durable, exact and so on, but really, £260! 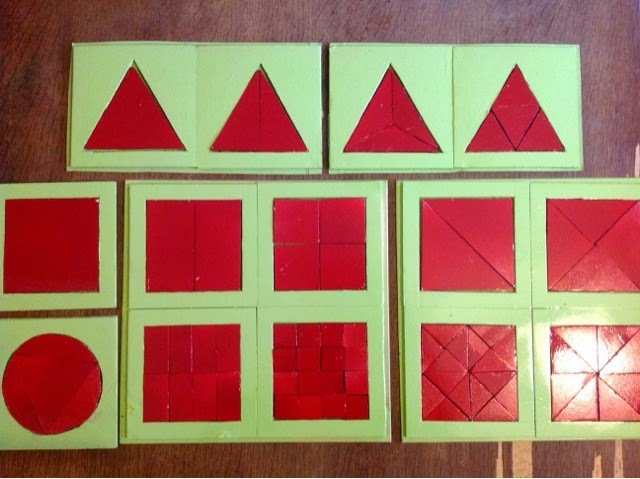 I made the square figures, the triangle figures and a circle for learning the parts of a circle (chords, arc etc). 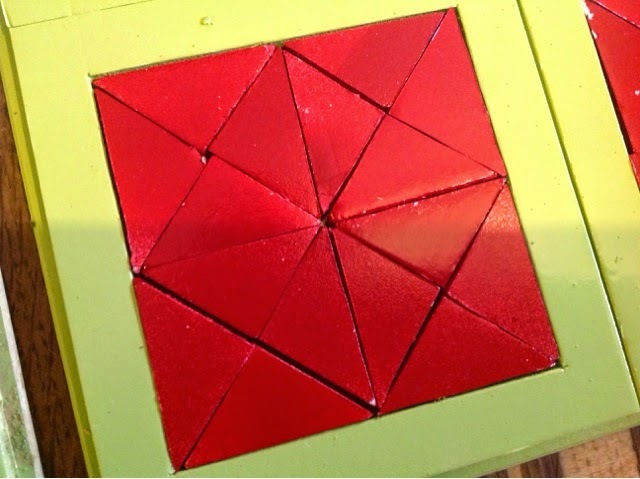 First I cut 14 squares (14 x 14 cm), then I very carefull measured, drew and cut out the centre shape. Making sure all the squares were the same and all the triangles were the same. I made these as precise as possible using a ruler protractor and set square. 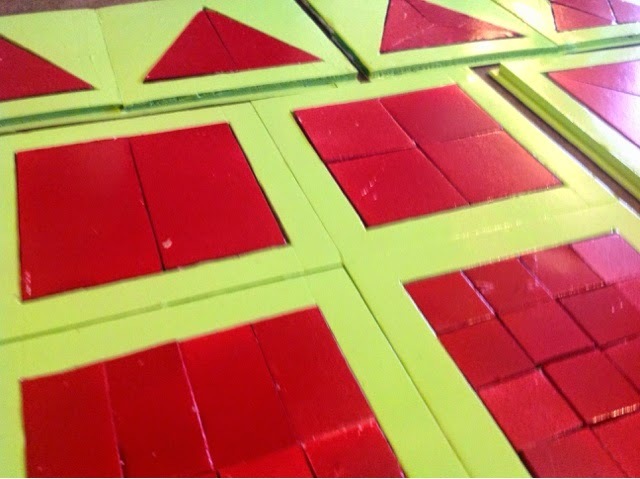 Next I just cut up the centre pieces into half, quarter, eighth and sixteenth pieces. I say 'just' but it took ages, as you can see they are not exactly exact but they are very close and I am happy with them. I then stuck the frames down onto some mount card I had around and then finished it all with a few coats of spray paint. The very small pieces are a little bit delicate but this is an elementary material so it should be fine and so far the coats of paint have stopped any of the crumbling edges. I think that it will be strong enough to cope with my children but it probably wouldn't survive several classes full so I can see why the schools buy the iron.